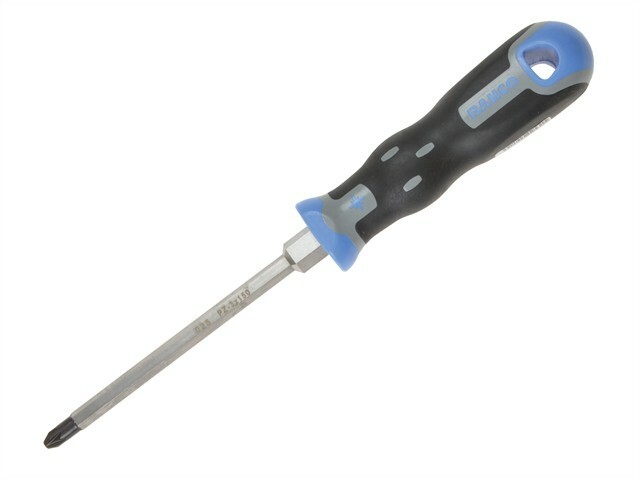 Bahco Tekno+ Series 025 Pozidriv tip, Hex shank screwdriver for Pozidriv head screws. The hexagon profile blade and bolster allow the use of a wrench for jobs that require more torque. The double shape handle allows an optimum grip and maximum torque power. The hole in the handle allows the insertion of a T-bar for added force transmission and it has permanent colour codes at both ends of the handle, for a quick identification of the tip. Pozidriv Tip: PZ2 x 125mm Hex Shank.